A Moldovan artist has created an exhibit to highlight the banking scandal that rocked the country in 2014 when $1 billion suddenly disappeared from three banks in the small Eastern European nation. 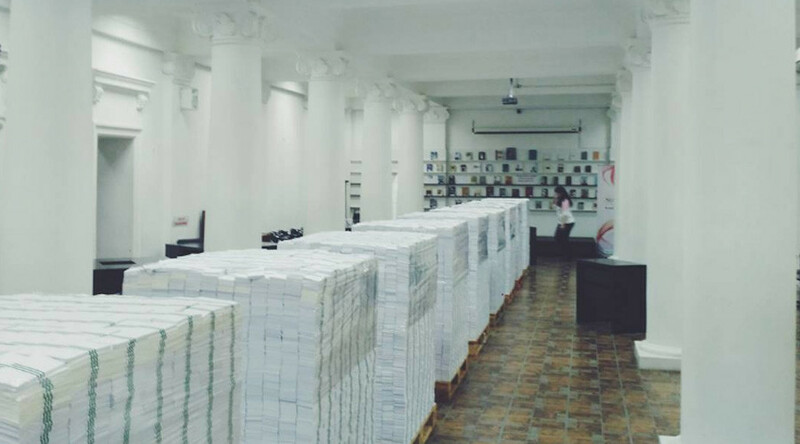 Stefan Esanu’s exhibition of 10 massive stacks of fake $100 bills, each weighing 500 kilograms (1102 lbs), are on display at a library in the capital city, Chisinau. The stacks represent the amount of cash which disappeared from the banks in Europe's poorest country in 2014. The money, amounting to one eighth of the country's GDP, was siphoned from the exchequer into shell companies outside its borders, prompting months of anti-government protests. Former Prime Minister Vlad Filat was sentenced to nine years in prison following an investigation into the scandal, while a number of government and banking officials are still under investigation. Speaking to the Report news website, the artist said that he wanted to help people visualize just how much money had been stolen from their pockets. "People have no idea what a billion means. It is like saying 'cosmos' but people cannot imagine what this really means," Esanu said. The billion dollar debt weighs heavily on the Moldovan people's shoulders, after the government agreed to absorb it as part of negotiations with the International Monetary Fund (IMF).